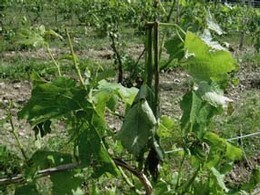 They say that a vine must struggle to make great wine. If that’s the case then this year should be a great vintage. After our “winter that wasn’t” awoke the vines too early, they were smacked by frost with mid-twenties temperatures in the first week of May. There was loss of 20-50% of the crop, depending on your micro-climate. This was a situation where your location was crucial to spare you from frost damage. 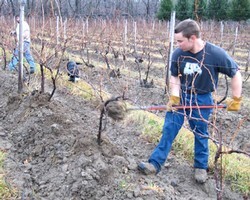 Heron Hill on Keuka Lake happens to be in one of the coldest, most difficult locations in the Finger Lakes and they lost about 30% of the Riesling crop. Ingle Vineyard on Canandaigua Lake is more favorable, being at lower alt itude, down by the lake. There, frost damage was minimal, at 5-10%. Last week, just as I was about halfway through my “Thank you, I’m so grateful, mother nature” soliloquy, we were broadsided by one of the most intense storms that I’ve experienced in forty years of farming. Fifteen minutes of hard driving, marble-size hail, strong winds and rain. Time stopped, you couldn’t drive or walk in this stuff. When it had blown over, the vines were beaten and bedraggled. The leaves were torn as if by cats’ claws, and the canes were snapped off half-way like they’d been hedged. There were dead leaves everywhere. In shock and dismay, I surveyed the damage. The fruit was mostly intact. We won’t know until after bloom, but there is a silver lining to the dark cloud of potential disaster. We’v e just barely made it through May and it already seems like it’s been a long summer. After almost 40 vintages, it does seem like they tend to slip by, but one never knows what pot of gold may lie at the end of rainbow – only time will tell. One of Mother Nature's alarm clocks is ringing. Actually it's plinging, like the sound of dripping maple sap from a spigot into a metal bucket. The pace can be slow and steady or it can be surprisingly fast, almost pouring out of the tree. To those tuned into the rhythms of nature, this is a wake up call. Here is a photo essay of an upstate maple syrup session. And that's just the first batch of what could be 4 or 5 passes! Our game-plan with the garden is to work (focus) for seven months and then enjoy the fruits of our labor for the five winter months. We freeze a lot of our food; spinach, peas, corn, broccoli, beans, all freeze well. 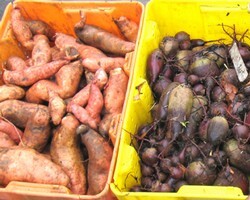 Fruits also are stored frozen or dried including pears, strawberries, peaches, raisins, etc. 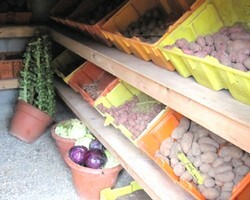 Mother Nature does a beautiful job preparing us for winter storage with root vegetables. Our root cellar is chockfull with potatoes, carrots, beets, parsnips, brussels sprouts, onions, garlic and the "best thing you never ate": celeriac! Sprinkled with olive oil, and oven roasted at 400 degrees for 20-30 minutes, along with slices and chunks of the other root crop, it tastes nutty and unique like nothing you've ever had. Try it. Celeriac is also good boiled, mashed and added to mashed potatoes - ah the bounty. For over 40 winters we've pruned the vines in the daytime and savored the fruits of our labor at night - what's wrong with that game-plan?